The General Administration of Quality Supervision, Inspection and Quarantine of the People’s Republic of China (AQSIQ) has published the list of unqualified imported food in September 2014. According to the list, there were 345 batches of improted food in total returned or destroyed by local CIQs. Most of these rejected foods were imported from Taiwan,Thailand, France, USA, England, Malaysiya, Australia, Italy and etc. The total weight was 633 tons. Please refer to the following 2 figures for detailed information. 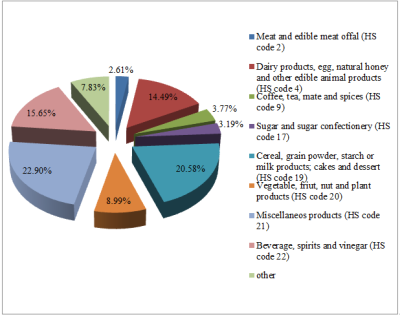 Figure 1 shows that these unqualified imported products mainly belong to 4 food categories which occupy more than 70% of the total weight. These 4 categories of foods are miscellaneos products (HS code 21), cereal, grain powder, starch or milk products, cake and dessert (HS code 19), beverage, spirits and vinegar (HS code 22) and dairy products,egg,natural honey and other edible animal products (HS code 4). They occupy 22.90% (HS code 21), 20.58% (HS code 19), 15.65% (HS code 22), 14.49% (HS code 22) of the total weight of the rejected imported food, respectively. Moreover, products belong to HS code 21 and HS code 19 were also the two mostly rejected imported foods in August 2014.They occupy 20.69% and 29.54%, respectively. 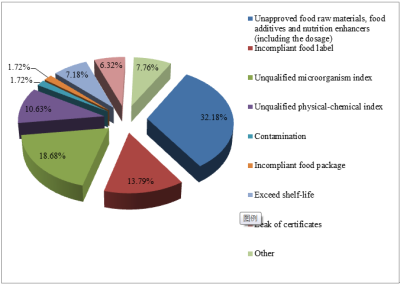 There are about 8 kinds of incompliant reasons for imported food, but most of them were rejected for 4 reasons, namely, the use of unapproved ingredients, including food raw materials, food additives and nutrition enhancers (32.18%), incompliant food label (13.79%), unqualified microorganism index (18.68%) and unqualified physic-chemical index (10.63%). Imported foods were also rejected by China CIQs for these 4 reasons in last month, especially for the first one (37.93%). The situations are similar in both August and September. Information about the unqualified imported food rejected by China CIQs in August 2014 can be found here.